Where did you work exactly, and what were your responsibilities? I worked in the Risk Management Unit and was responsible for the preparation of selected parts of the Risk Report 2017, in particular, coverage of outward and inward spillovers and policy uncertainty related issues in Article IV reports, writing various reports, e.g. about current US reforms, and the development of a baseline model aiming to update the current Vulnerability Exercise Approach. How did your regular working day look? At the IMF the working day starts at 9 (or 10, depending on the division) and lasts the usual 8 hours. The regular working day is full of meetings, responding to e-mails, reading, writing and coding. Was there anything particular from your PhD studies which helped you to do this job well? My job demanded a strong econometrics background and the four semesters of different econometrics courses here at CERGE-EI were extremely helpful. What was the best experience you got? The opportunity to work on real-world issues, attend different seminars and courses, and meet and talk to well known economists such as Maurice Obstfeld and Ami Nakamura. Did you have a chance to meet some of our alumni who work there as well? Yes. I met Yaroslav Hul (an economist in the Institute for Capacity Development), Svitlana Maslova (an economist in Strategy, Policy and Review Department), and, during one of the board meetings, Michaela Erbenova (Executive Director representing Austria, Belarus, Czech Republic, Hungary, Kosovo, Slovak Republic, Slovenia, and Turkey). Did they inspire you in any way? Absolutely, meeting people with a similar background, observing what they have accomplished, while working in the same institution, inspires a lot. Their experience pushes you to work harder to achieve your own goals. Do you think that our students know enough about paid internships? Definitely not enough. When I was a 2nd year student, we received an e-mail from a faculty member about the internship at the IMF. It was the first time I had heard about it. Unfortunately, afterwards we stopped receiving any updates about IMF programs. But as I already knew about it, I kept monitoring all available information and, when the time came, I applied. 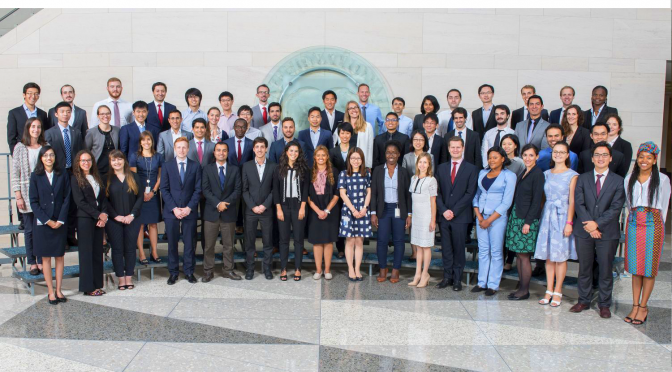 The application for a summer internship in the IMF is already open and I would encourage all interested students to apply. There are also internships in the World Bank and European Central Bank (for example), but I can’t remember being informed about them by the school. Thank you, Olga. This is surely a good point. To spread information about similar opportunities among our students more effectively, we will keep publishing notices on our internal webpage. More details coming soon!